It is a fact that professional athletes of all kinds use weight training (bodybuilding) to improve their strength and performance at their sport. Not all bodybuilders are good athletes, but most good athletes are bodybuilders to a greater or lesser degree. Bodybuilding is more than just a sport or hobby for a veteran athlete who is finally reaping the rewards for pursuing a lifetime passion. A fitness fanatic, Nishantha Perera was an all-round sportsman as a student at Royal College achieving a fair degree of success trying his hand at rugby, boxing, athletics, wrestling, karate and football. However, it was in bodybuilding that he basked in glory representing Sri Lanka at international level. For the four-time Mr. Sri Lanka title holder in the Over 50 age group Masters category conducted by the Sri Lanka Bodybuilding Federation, the crowning glory came at a championship organized by the Natural Bodybuilding Union International (NBBUI) in New Delhi on March 23. The lone representative from Sri Lanka at this meet, the 54-year-old bagged the Mr. Asia Masters title in the Over 50 age group beating off competition from 12 countries including host India. It is the first ever gold won by a Sri Lankan in competitions organized by the Italian-based NBBUI which has been in existence for nearly four decades. However, it was not the first international success for the bodybuilding veteran from Sri Lanka who made his debut in the sport in 2010 before going onto win his first Mr. Sri Lanka Masters title in 2015. Nishantha’s stature improved by leaps and bounds after he came under the wing of NBBUI consultant trainer Luka Cicolella from Italy who was in Sri Lanka for three months last year. He achieved second position in the Mr. and Mrs. Universe NBBUI meet in the Over 50 Masters category held in Germany and Small Bodybuilder 80kg competition at the same event. He also took third place in the NBBUI World Championship held in Delhi in the Over 50 Masters category. “I trained continuously for eight months under Army bodybuilder Charith Kumara and followed the meal plan, vitamins and workout schedule given by Luka. 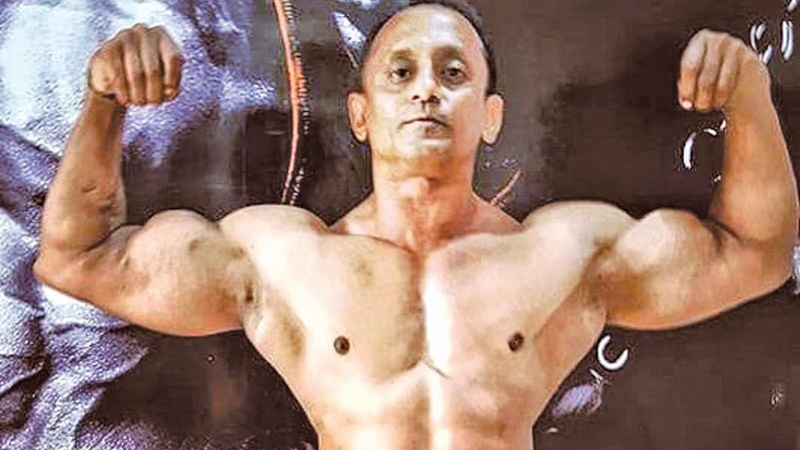 I trained three hours a day for five days a week in the gym,” said Nishantha who has no plans of continuing to practice bodybuilding even past the retirement age of 60. “I could not believe when I was announced champion although I was confident I had the muscle definition in my biceps, abs and legs. It was a dream come true and a result of my dedication to a sport which has been my passion from childhood,” said Nishantha, a seafood supplier by profession from Maharagama who spends his personal funds in his pursuit of glory to win a Cup and medal. “I get personal invitations to compete at international meets from NBBUI. We get satisfaction and pride to represent Sri Lanka even if we have to spend our own money. However, I make an earnest request to the Sports Minister to grant us recognition by at least providing a letter to apply for visa,” said Nishantha who hopes to compete in a Pro-League competition in Iraq in July.